Lochmoor Club located in Bentonville, AR is one of Bentonville's finest neighborhoods. Lochmoor Club has many amenities including a gorgeous community pool, a playground, tennis and basketball courts and is located near 2 top elementary schools - Central Park and Willowbrook elementary schools are right around the corner from this great subdivision. Home is truly a one-of-a-kind masterpiece - featuring wood beams, hardwood floors, copper farmsink in kitchen, theater room with stadium seating, a bedroom of any kids dreams with 2 lofts... upgraded slate floors, 4 zoned heat and air, premium (I really think it is the best lot in lochmoor) cul-de-sac lot that backs up to the woods, tankless water heater with instant hot water, antique brick, a 150 year old cabinet with copper sink in powder room... the list goes on and on. Be sure to WATCH the VIDEO to view all of the photos. 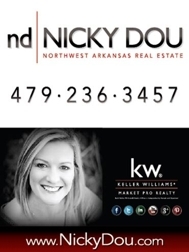 I listed the home yesterday (April 16th - and we have had 7 showings (2 repeats)... I predict this home WILL SELL by weeks end. So CALL ME IF YOU ARE INTERESTED in seeing it. 479-236-3457 or email me. HOWEVER - I just listed today (May 18th, 2012) another beautiful home for sale in Lochmoor Club. This home is located at 704 Edinburgh Ave. It is 3007 ht.sq.ft. with 5 bedrooms, 4 full baths - bonus room, great covered back patio and large fenced yard! Sure to go quickly as well - CALL, TEXT (479.236.3457) OR EMAIL ME if you would like to see this one before it is SOLD! I am holding an open house (if it doesn't sell tomorrow, that is...) on Sunday May 20th, 2012 from 2-4. Below is the video for my new listing in Lochmoor Club... enjoy!